The U.S. District Court for the Eastern District of New York has given preliminary approval to a settlement reached in a lawsuit between merchants and credit card companies. Merchants alleged Visa and Mastercard, separately, and together with certain banks, violated antitrust laws and caused merchants to pay excessive fees for accepting Visa and Mastercard credit and debit cards. Both groups agreed to the settlement. 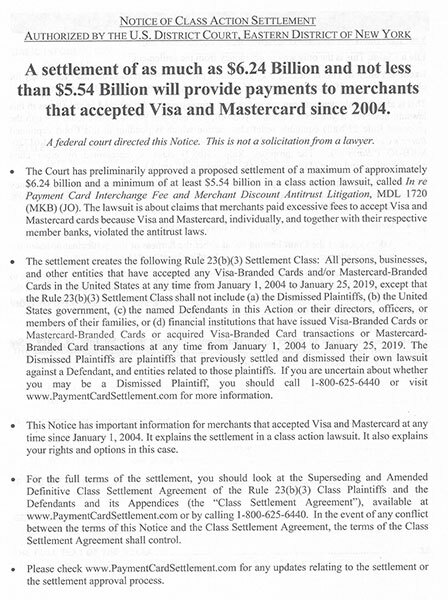 The original settlement, worth up to $7.25 billion for merchants who accepted payments from 2004 to 2012, was vacated by the Second Circuit. The new settlement includes all merchants who accepted Visa or MasterCard branded debit or credit cards from January 2004 to January 25, 2019, the date the agreement was reached. Unless merchants want to opt-out by the July 25, 2019 deadline, there’s nothing to do right now. It’s too early to file a claim and merchants will automatically be notified later. Paymentcardsettlement.com is the official site for merchant information and future claim registration. What is Recurring CoF Monitoring? Recurring CoF monitoring is related to merchants using stored cards on file for recurring billing. Merchants are getting notices from acquirers about failing MasterCard Data Integrity reporting and, from what I’ve seen, only have two weeks to correct the issues. The below merchant has been identified by the latest MasterCard Data Integrity reporting as failing Edit 21 – Recurring CoF Monitoring. Per MasterCard, all recurring payments are considered credential-on-file transactions. MasterCard requires POS entry mode= 10 (credential-on-file) to be sent for transactions identified as recurring. Please work with the POS vendor and these locations to correct the POS entry mode. If corrections are not completed, merchants are subject to non-compliance assessments and fines will be allocated. Basically, a merchant must comply with rules about how a transaction is presented to the acquirer and the issuer for authorization. The payment gateway is largely in control of sending the correct data with each transaction. In the example violation notice, the merchant is not compliant with recurring payment rules which requires specific steps when storing a card for the first time and then for ongoing payments. The 3Dmerchant.com blog has many articles about the Visa Stored Credential Mandate. Visa’s are the most stringent and by following them, merchants will also be compliant with MasterCard’s. The rules went into effect in October 2017, with enforcement delayed to May 2018. Despite some claims to the contrary on payment gateway web sites, the mere fact that a payment gateway can support the correct data set does not make a merchant compliant automatically. Merchants should read the rules on this web site, which includes links to the card brand rules. Card brand rules (Visa, MasterCard etc) are constantly changing and many payment gateways have not kept pace with been given a notice, then don’t call your existing provider. The rules were announced in 2016 and went into effect for most businesses (some were earlier) in October 2017. If your vendor let this happen to you, it’s time to get advice from another source. Here’s a list of payment gateways compatibility status. Call Christine Speedy, CenPOS Global Sales. 954-942-0483, 9-5 ET for all your stored credential payment gateway and virtual terminal needs. CenPOS is an integrated commerce technology platform driving innovative, omnichannel solutions tailored to meet a merchant’s market needs. Providing a single point of integration, the CenPOS platform combines payment, commerce and value-added functionality enabling merchants to transform their commerce experience, eliminate the need to manage complex integrations, reduce the burden of accepting payments and create deeper customer relationships. The largest-ever class action settlement of an antitrust case appears to be nearing an end. Visa Inc, MasterCard Inc, and banks including Bank of America, J.P. Morgan Chase and Citigroup, have agreed to pay $6.2 billion as part of the settlement. The class-action lawsuit was filed in 2005 by merchants who alleged card companies set credit-card fees and card-acceptance rules that benefit the banks, which owned Visa and MasterCard at the time. Both are now public companies. It was previously settled in US District Court but thrown out on appeals. After throwing out the the settlement, the court divided the merchants’ claims into two separate classes, one for monetary damages and the other for Visa and Mastercard’s business practices. This settlement is for the class focused on monetary damages. What do merchants need to do? Nothing. The settlement must still be approved by a court. Further information will be released at a later date. Compliance is not just about payment security. Each card brand has a set of rules for payment processing. Follow them and get rewarded with increased authorizations, reduced fraud risk, and lower merchant fees. The cost of non-compliance is heavy and getting worse. Look at this MasterCard PROCESSING INTEGRITY FINAL ATH Fee on a recent Chase Paymentech merchant statement. Over $536,000 multiplied by .25% penalty fee for a total of $1,340.10 in avoidable costs. This is due to not properly authorizing and settling transactions, including reversals for unused authorizations. It’s too complicated to get into why this happens, but I’ve written multiple articles related to authorization validity, including one about the Visa Stored Credential Mandate. Authorization expired. The Final Authorization transaction is not cleared within 7 calendar days of authorization date, nor has it been fully reversed. Authorization mismatch. The Final Authorization amount does not equal the clearing amount. Unused Authorization. The Final Authorization transaction did not clear and full authorization reversal was not submitted. What’s really painful about this one, is if an order is cancelled, you can lose .25% of the transaction amount so you lost money not making a sale! Final authorization currency code does not match the clearing currency code. How can merchants avoid the MasterCard Processing Integrity fee? Technology to manage the authorization and settlement process is the only way. Leaving it up to employees to figure out when an authorization is expiring and when a reversal is needed is a recipe for compliance fees like the above. Plus, chances are whatever system they’re using doesn’t even support the required data messages that need to go with the transaction. The payment gateway plays a crucial role in authorization validity. A common misconception is that using a popular gateway, or even one owned by a card brand, or acquirer, will automatically get your transactions compliant. That is not the case. I have extensive knowledge of many payment gateways. In my opinion, the CenPOS cloud commerce platform with suite of business solutions, including payment gateway, offers the best tools to automate authorization validity so you can avoid the MasterCard processing integrity final authorization fee as well as other penalty fees and assessments by multiple card brands. Source: MasterCard Transaction Processing Rules 28 June 2018 TPR, Wells Fargo Payment Network Pass-Through Fee Schedule April 2016. Christine Speedy, CenPOS Global Sales, 954-942-0483 is based out of South Florida, near Fort Lauderdale, and Rochester, NY. CenPOS is an integrated commerce technology platform driving innovative, omnichannel solutions tailored to meet a merchant’s market needs. Providing a single point of integration, the CenPOS platform combines payment, commerce and value-added functionality enabling merchants to transform their commerce experience, eliminate the need to manage complex integrations, reduce the burden of accepting payments and create deeper customer relationships. to optimizing commercial card payments. Selecting the right merchant acquirer and payment gateway, and optimizing interchange, can help reduce suppliers’ collection efforts and costs associated with commercial card payments. By Marie Elizabeth Aloisi and Peter Michaud. Christine Speedy, blog author, reviews the guide. In my opinion some elements, present an incomplete picture for merchants, especially the business suppliers accepting commercial payments that is the target of the paper. I have a problem with the next line in the report, “That’s because getting paid by check—or even ACH or wire—involves many manual steps, onerous costs, and potential errors that are a burden to a supplier’s accounting, finance, and treasury functions.” Checks are still the most onerous even with a scanner, but with electronic bill presentment and payment, any other payment method can be automated for increased efficiency. Our cloud payment processing solutions, including integrated with ERP, automate all types of payment processing, including check/ACH, wire, credit card, and can update journals etc. The paper goes on to explain why working with your acquirer is critical. While it mentions suppliers can benefit from advanced gateways, most acquirers offer a limited number of payment gateways to merchants. In fact, they may offer suppliers only one solution – they’re own- and it may not be the best for the supplier, it’s just the only one they offer. Independent payment gateways, like CenPOS that I offer, can provide significant advantages to maximize profits, efficiency and flexibility. For example, fulfilling the need to simplify wire transactions and match to invoices. The three best practices cited to work with acquirers are to automate payments, optimize interchange and negotiate pricing. The devil is in the details not cited. For example, “suppliers can only take advantage of lower interchange rates if the payment gateway is set up to pass Data Rate 3 information along with the transaction.” This is true. But the bigger problem is compliance with all the other rules required to qualify the transaction for Data Rate 3. For example, suppliers often do a preauthorization, which expires before settlement (but can still settle) or is not the same as the final settlement amount. These common transaction types will nullify qualifying for the best interchange rates, including MasterCard Data Rate 3. There are many more rules that make it tough to qualify and if the payment gateway does not automatically manage for suppliers, passing Data Rate 3 info doesn’t matter. The reality is most payment gateways do not have a solution to help suppliers comply. Again, if the acquirer doesn’t have the best solution, should suppliers rely on their advice? A supplier client of mine went to their acquirer (top 5 in USA) and told them what I was offering. They would keep their acquirer but switch to my payment gateway; they’d use our electronic bill presentment and payment solution to eliminate paper credit card authorization forms and employees getting cardholder data over the phone. Customers would self-manage their payment methods, including storing & tokenizing if they chose to. Their acquirer did not want them to use any solution other than their own. They offered them a substantially worse solution- the silliest I’ve ever heard. The acquirer would give them a new merchant account with virtual terminal exclusively for one large client that they knew was using a commercial card. What about all the other clients? What about eliminating employee access to cardholder data and storing data on paper? Advising to use substandard solutions happens all the time. In summary, Mastercard and The Strawhecker Group put out some great research data for suppliers. I’m a huge fan of the people at The Strawhecker Group and their work. Suppliers should look to cloud payment processing solution providers like myself at CenPOS for advice. Suppliers need the best payment gateway because without it, the rest doesn’t matter. Combining a robust payment gateway, business solutions, and the flexibility to change acquirers without business disruption can provide significant advantages. All comments and statements herein are strictly my personal opinion and do not represent that of any company. Christine Speedy, CenPOS sales 954-942-0483. CenPOS is a cloud business solutions provider with end-to-end payments engine that drives enterprise-class solutions for businesses, saving them time and money, while improving their customer engagement.